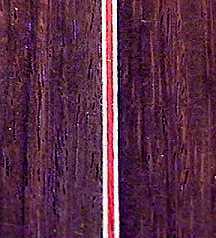 For the back, I have already joined the back halves, inlaid a white/red/white thin backstrip, cut 1/2" outside the guitar-shape outline, and marked the spots for the braces. Here I am gluing in the spruce back reinforcement strip. I clamped down my metal straightedge at half the width of the backstrip from the center line. Against this, I glued down the back reinforcement strip, clamping it down with a single wood bar. 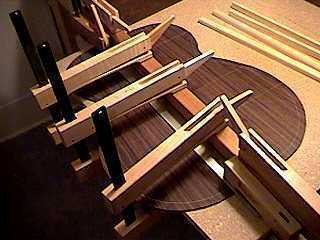 Tomorrow I will use the go-bar deck to glue on the arched back braces. July 10, 1999 . . . . 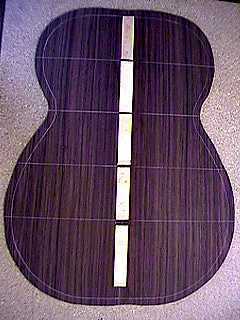 Here is the back reinforcement strip after the glue has set. I have not yet sanded or shaped the strip (rounding the edges). July 11, 1999 . . . . To the right is the back, after it has been braced and the braces shaped. I used the go-bar deck, with the back sitting atop the 15-foot-radius dish, to glue on the braces. 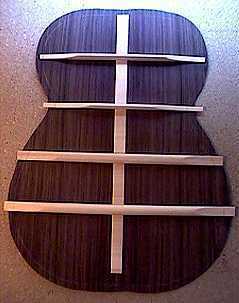 Here's the back inlay strip, made of three wood veneer lines. This is the same pattern that will run underneath the bindings on the sides.